The 15-year exile of the BJP in Uttar Pradesh ended with the announcement of Assembly Election Results on 11 March, 2017 as the BJP supported by a colossal Modi wave stormed back to power in the state. Very few political pundits foresaw the scale of the BJP’s victory in Uttar Pradesh. During elections some analysts and election psephologists have termed the fight too close to call. In the end, there was nothing close about the outcome in India’s largest and most populous state, where the Modi wave has blown away the Samajwadi Party-Congress boat in which Uttar Pradesh Chief Minister Akhilesh Yadav and Congress Vice-President Rahul Gandhi floated their hopes. The BJP juggernaut rolled on in Uttar Pradesh and in the neighbouring State of Uttarakhand in such a way that stunned poll pundits, analysts and media persons alike. Powered by an aggressive campaign by PM Shri Narendra Modi and party National President Shri Amit Shah, BJP candidates registered massive victory in whopping 325 out of the 403 constituencies in the state. The outcome was also a personal triumph for Prime Minister Shri Narendra Modi, who led from the front on an election, where the 24×7 media and opposition tried their best to project it as a virtual referendum on Union Government’s performance and popularity and the poll analysts who have tried to seen the elections as a ballot on Modi government’s historic decision on demonetization. The Modi wave not only demolished the dreams of SP-Congress alliance and the BSP, it also surpassed its previous best records of winning 221 seats in 1991 Assembly polls when it was voted to power for the first time in the State. The BJP had then won 221 seats out of 425 (Then Uttarakhand was part of UP). The BJP got a vote share of 31.5% and Shri Kalyan Singh became Chief Minister for the first time. In UP the BJP+ won a landslide victory with 42% vote by bagging 325 Assembly seats out of 403, thus effectively decimating its rival Samajwadi Party-Congress alliance to 54 seats and Bahujan Samaj Party to a dismal 19 seats. The result showed that the BJP made big inroads into the traditional dalit and minority vote bank of both SP and BSP and was able to get support from all castes and religions. The crushing defeat of the opposition is a big setback for the grand old congress party as it had pinned all hopes in the Assembly elections for its revival ahead of the 2019 Lok Sabha polls. This election proved to be the second setback for the BSP, after May 2014 Lok Sabha polls when the party drew a blank. The Assembly polls this time has taken the party back to 1991 when it had won 12 seats in the Assembly. Similar is the case of the ruling SP, which also made a dubious history of its worst ever performance in it’s 25 years of existence. In 1991, Assembly polls, the SP won only 30 seats. But the worst was in store for the Congress as its tally was reduced to lowest ever of seven seats in the UP Assembly. The previous lowest ever Congress number in the Assembly was in 2007 when they had won 22 seats. In an outcome unmatched over the last 40 years, the BJP on its own won 312 out of 403 (77.4%) seats in India’s largest state assembly, increasing its vote share to a jaw-dropping 25 percentage points from the 2012 assembly elections to 39.7 % in 2017. Its alliance partners AD(S) got 09 seats with 1% of votes and SBSP got four seats with 0.7% of votes and combinely took the total to 325 seats. The BJP almost repeated its performance from the 2014 parliamentary elections, when it won 42.7 % votes and 73 (more than 90%) of 80 Lok Sabha seats. This vote share and seats won as a percentage of total seats, is the best by any party after 1977, when, in the wake of the Emergency being lifted, the Janata Party won 352 seats of 425 (82.8%) seats and garnered 47.8% votes in Uttar Pradesh (Then Uttarakhand was a part of UP). BJP hailed the spectacular victories of the party in Uttar Pradesh as a vindication of PM Shri Narendra Modi’s popularity and his pro-poor and pro-development policies. Party National President Shri Amit Shah, who crafted and conducted the election strategy in UP said the results have catapulted Shri Modi to the stature of the tallest leader since Independence. “The only factor for the win is the performance of the Modi Government at the Centre,” Shri Shah said. Congratulating the BJP National President, PM Shri Narendra Modi in a Twitter post said, “Congratulations to Amit Shah Ji, party office bearers & state units for their exemplary work in taking the party to new heights”. 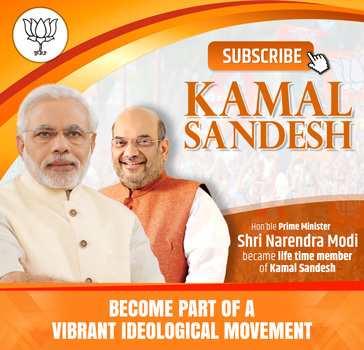 After the election victory Uttar Pradesh BJP President Shri Keshav Prasad Maurya said, “It is a Modi wave. The wave which started with 2014 Lok Sabha elections is continuing in 2017 and the momentum will go beyond the 2019 general elections”. Like in Uttar Pradesh, the BJP also stormed back to power in Uttarakhand securing a similar three-fourth majority win. The vote share climbs from 33% in 2012 to 46.5% this time. In a state that has always witnessed close contests in the assembly polls since its formation in 2001, this allowed the BJP to sweep the state with a 13 percentage point lead over the rival Congress. The BJP added to its share essentially by eating into the vote of all others. In Uttarakhand, the BJP bagged 56 out of 70 seats reducing the Congress to just 11 seats. It is for the first time in the 16-year history of Uttarakhand that a party has emerged with an impressive tally like that recorded by the BJP. The Bharatiya Janata party was successful in securing 32.5% of the total votes in Goa. As per the data released by the Election Commission, the Congress, which bagged 17 seats in the 40-member House, secured 28.4% of the total votes. BJP won 13 seats, falling eight short of getting the absolute majority. Maharashtrawadi Gomantak Party, which won three seats, polled 11.3% of the total votes, the data showed. 1.2% people opted for NOTA. The BJP along with its alliance partners like the MGP, the Goa Forward and Independents who won three each, got the majority in the state. Aam Aadmi Party, which hit the State with a big fanfare, drew a blank with almost all the candidates lost their deposits. In Manipur, the BJP has become the single largest party in terms of 36.3% vote share. Like in Goa, the mandate in Manipur was fractured with ruling Congress bagging 28 out of the total 60 seats and BJP getting 21. The Congress, which had won 42 seats in the 2012 Assembly poll, suffered a jolt. The BJP, on the other hand, took a giant leap forward capturing 21 seats as the party had not a single member in the outgoing House. In comparison to these states the BJP contested much fewer seats in Punjab. The BJP-SAD combine got around 31% vote share. However, the Congress lost vote share in majority of the states. After the huge BJP victory political analysts concluded that the key reason for the victory of the party was PM Shri Narendra Modi’s enduring appeal. Apart from it the pro-development, pro-poor agenda of the Union Government, India’s strong economy, high GDP growth, low inflation, shrinking fiscal deficits, record-high foreign investment flows, for which 80% people feel the economy is in good shape and the country is on right track under the leadership of PM Shri Modi, have been other major factors for the decisive victory. He specially mentioned BJP National President Shri Amit Shah for taking the party to new heights. He also replied to tweets from the public. “All our time & energy is fully devoted towards fulfilling people’s aspirations,” he said in response to Sri Sri’s congratulatory tweet. “More than my understanding, it is the people who have trusted the BJP & we will never betray this faith,” he replied to Sachin Bansal. The BJP won even reserved Dalit constituencies in Uttar Pradesh, earlier what was seen as a captive vote bank of the BSP. Out of 85 reserved seats in UP, the BJP won 75. Out of 75 three seats each went to BJP’s ally, the Apna Dal and Suheldev Bharatiya Samaj Party. This came as a surprise because the Dalits comprising 21% of the state’s population were seen as hostile to the BJP and favoring the BSP, which ended up with just two seats. The Samajwadi Party-Congress alliance secured seven and a lone independent won. The BJP victory decimated the conventional logic that SC do not vote for the BJP and, instead, try to defeat the BJP. Mayawati and Akhilesh Yadav have all reasons to be upset with the Uttar Pradesh poll results. Not only their parties failed to return to power, the BJP secured massive victories in Muslim dominated areas – where SP and BSP used to enjoy lead in previous polls. 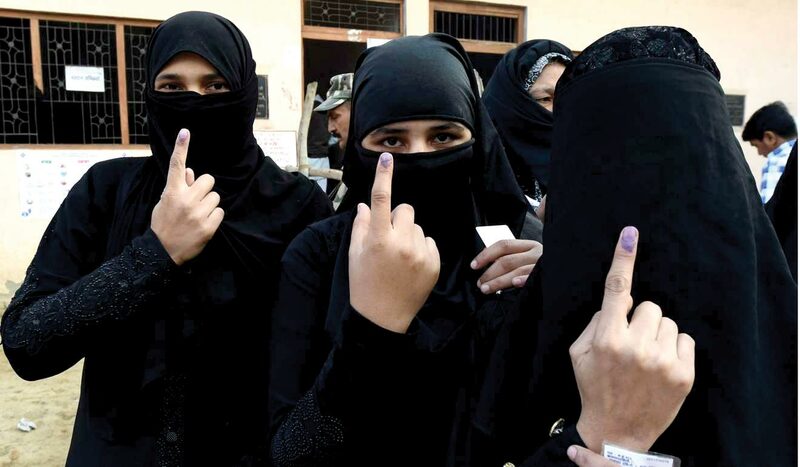 From all six constituencies of Muzaffarnagar to Deoband in Saharanpur, Bareilly, Bijnor and Moradabad where Muslims dominate the demography, the BJP swept the polls. Both in Western and in Eastern UP, BJP has found strong support from Muslim community. There was huge turnout of Muslims in PM Shri Modi’s rally in Varanasi. In Mirzapur and Varanasi, Muslims constitute the strong weaver force of the handloom sector. Political analysts believe that Modi Government’s recent flagship programmes like Gurur-Shishya Parampara programme offering paid training to unemployed Muslims is likely to have helped the party win minorities’ support in the state election. When the 17th Uttar Pradesh legislative assembly convenes, there will be a record 32 women MLAs of BJP out of 38 attend the house since Independence. Victory of 32 women MLAs from one political party is also a record in UP. 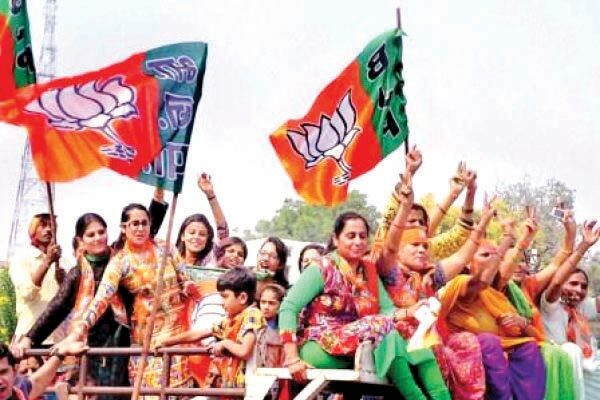 BJP gave tickets to 43 women, the highest among all the parties. Of these, 32 won. From BSP and Congress, two women won, while one each from the Samajwadi Party and Apna Dal were also elected. According to records available with the Election Commission, in 2007, the number of elected women MLAs were a mere three, but in 2012 a record 35 were elected. In 2017, this number has gone up even further, which is a welcome sign.